The last thing Sara imagined before death claimed her was to wake up on a strange vessel sailing through the vast reaches of outer space. She certainly didn’t expect to land on a planet inhabited by aliens, much less having to mate with one of them. To her astonishment, she was captured by the leader of the alien horde, only to be claimed as his mate. Fear crept into Sara’s heart at the thought of her secret being discovered, but that was the last of her worries as she faced an ultimatum; to live, or die. What would she choose and where would this decision lead her? Archail was a proud Pradorian warrior. He was meant to lead his people to a promising future, but was unprepared to find himself with a stubborn Earth female who, to his annoyance, became his main concern; her survival his unwavering goal. Highly imprinted in him the sense of duty and a promise to his people; procreation would again be possible. But would he be willing to sacrifice himself for a woman from Earth? Would she accept he only thing he hadn’t given throughout his immortal life, his heart? She was seventeen and right in the middle of her junior year in high school. Her tight auburn ponytail moved with every step she took, dancing playfully around the white shirt that hung over the dark blue jean skirt. Skin colored stockings clung tightly to her thighs and rode all the way down until they met with black pumps which completed the carefully assembled outfit. Hanging haphazardly over her arm, a stately crest stood out proudly against her grey school jacket. Sara walked down the school’s long corridor laughing and joking with her friends as they went. It was almost the end of a long week, and she looked forward to the weekend, as well as the chance to rest and spend time with her family. Sara had never seen her father so pale before. He was still wearing the same beige pants and green shirt from that morning, but his expression reminded her of a day two weeks earlier when he’d told her mother he’d been fired from his job. He held the same drawn, shadowed look on his face now, as he eyed Sara, making her realize something was terribly wrong. She quickly said goodbye to her friends and ran to her father. C. Baely, the originator of “The Pradorian Mate”, was born in Australia. She has had an adventurous life and is currently settled down in Greece with her family. As a person with a creative mind and an equally busy lifestyle, she hopes to keep writing for as long as her unique, fantastical ideas keep flowing! 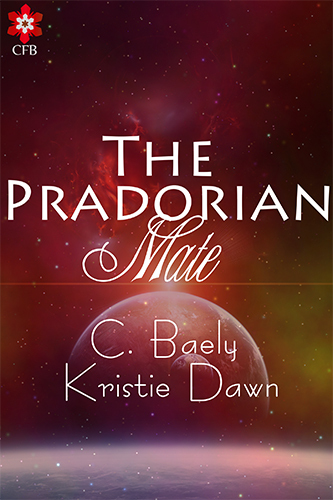 I, Kristie Dawn and co-author to “The Pradorian Mate”, born in Texas, am currently residing in Lampasas, Texas, United States. At 27 years of age, I’m happily married with two children and three moody, crazy cats.